This is an excerpt from Performance Nutrition by Krista Austin, PhD, CSCS, and Bob Seebohar, MS, RD, CSSD, CSCS. Endurance sports cover a variety of events consisting of short-duration (under 2 hours) to multiday competitions and include sports such as running, triathlon, cycling, rowing, canoeing and kayaking, swimming, biathlon, and cross-country skiing. Each endurance sport has its own individual nutrient timing challenges based on the intensity and duration of the competition. A short- and long-course triathlon provides a good overall example of how to implement a nutrient timing system within an endurance sport. Although the sport is triathlon, the system can be applied to many other endurance-classified sports because they share commonalities in energy needs. The main differences will be the length and the logistics of the competition. Competition details: There are four main distances in the sport of triathlon. Sprint-distance triathlon races typically involve a quarter- to half-mile swim, 12- to 18-mile bike ride, and 3.1-mile run. The Olympic-distance triathlon includes a 1.5-kilometer swim followed by a 40-kilometer bike ride (in a drafting or nondrafting format) followed by a 10-kilometer run. Half Ironman triathlons involve a 1.2-mile swim, a 56-mile bike ride, and a 13.1-mile run. Ironman triathlons involve a 2.4-mile swim, 112-mile bike ride, and 26.2-mile run (1 mile = 1.6 kilometers). Competition times greatly depend on the level of athlete, with professionals and elite age-groupers recording faster times and recreational and beginning athletes registering slower times. Sprint-distance events last approximately 55 minutes to 1 hour and 30 minutes, Olympic distances from 1 hour and 45 minutes to 3 hours, half Ironman distances from just under 4 hours to 7 hours, and Ironman distances from just under 8 hours to 17 hours. For recreational triathletes, racing usually begins early in the morning, between 6:00 and 8:00 a.m. Professional triathletes competing in Olympic draft-legal races often start racing later, between 11:00 a.m. and 3:00 p.m. Each event poses different nutrition challenges in terms of nutrient timing. Energy systems used: The aerobic energy system predominates, but it is important to note that all energy systems are relied on during some events, especially during the start. Nutrition goals leading up to competition: The main goals for most triathletes include reducing GI distress, maintaining adequate hydration and electrolyte levels, and not gaining weight due to a decrease in energy expenditure during their taper. Increasing daily salt intake is usually a common practice during the taper, but athletes should try this during quality training sessions well before the race because it sometimes leads to slight bloating and water weight gain. A two- or three-day fiber taper can be extremely beneficial for some triathletes who are more susceptible to GI distress or have a sensitive gut. It is recommended to decrease fiber intake by 25 percent each day two or three days out from the race by focusing on more white starch products and juices. Maintaining hydration status is important, and overdrinking water is a common practice. If water is used as the primary fluid throughout the day, salty foods should be eaten at the same time in an effort to prevent hyponatremia. It is also recommended that triathletes drink when thirsty and not try to hyperhydrate with water leading up to the race. Maintaining energy levels is crucial during the taper so that the craving response is reduced. In an effort to stabilize blood glucose levels, triathletes should combine a source of lean protein, healthy fat, a fruit or vegetable, and a starch during all feedings. Triathletes should avoid eating only a starch by itself because it will raise blood glucose levels quickly and could lead to overeating during the taper. Stabilizing body weight is a primary goal of all triathletes leading up to a race, and as mentioned previously, this is typically difficult to control because of decreases in training volume. Athletes should not overeat and try to overcompensate their caloric intake in an effort to load before competition. Most athletes who follow a balanced eating program consisting of moderate carbohydrate, moderate protein, and low to moderate fat should continue this type of eating during their taper. Frequency of eating may be a variable that triathletes can consider changing, meaning they may not need to eat as many times throughout the day. Eating to train during a taper becomes a good mantra to follow, and since training is reduced, so should food intake. A smaller breakfast made up of moderate carbohydrate, moderate to low protein, and low fat is recommended. A liquid snack or meal such as a smoothie may be beneficial for those who have very sensitive stomachs. Athletes should hydrate but should pay attention to not overhydrating with water alone as this can increase the risk of hyponatremia. Consuming water with salty foods or a sports drink with sodium is recommended. For athletes competing later in the day, a normal breakfast that has worked for the athlete during higher-intensity training can be eaten followed by an easily digestible snack 1 to 2 hours before the race. Liquid sources are typically preferred. After the race, it is common for athletes to forget about their nutrition. The postrace nutrition plan is crucial for allowing an athlete to replenish glycogen and fluid stores. The basic guidelines on what to eat in the first 15 to 60 minutes after a race include higher carbohydrate, moderate protein, and minimal fat and fiber. 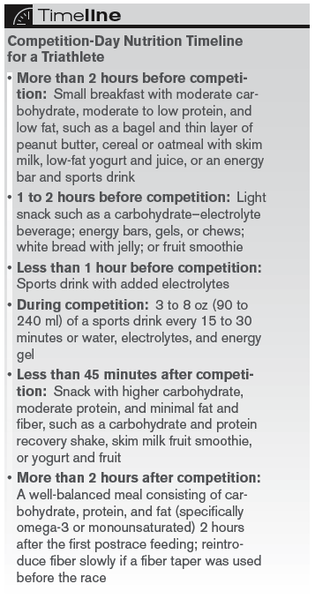 Athletes should plan ahead of time to ensure that foods or beverages are available after their race. After the initial feeding, athletes should try to eat well-balanced meals consisting of carbohydrate, protein, and fat (specifically omega-3 or monounsaturated) 2 hours after the first postrace feeding. If a fiber taper was implemented before a race, it is important to reintroduce fiber slowly into the normal daily nutrition plan by reversing the recommendations stated previously. That is, increase fiber gradually by 25 percent each day after the race to allow the body to get used to the normal amounts without causing GI distress.